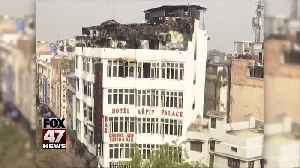 ▶ Videos for "Delhi Hotel Fire"
There were reportedly more than 50 people staying at the Hotel Arpit Palace when the fire started. 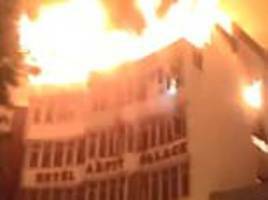 Dozens of them were rescued by fire crews. 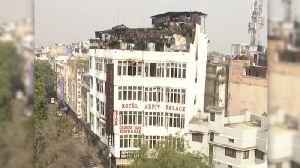 CNN reports At least 17 people died in a fire that ripped through a budget hotel in the Indian capital New Delhi early Tuesday.The blaze broke out in the Hotel Arpit Palace, in the central Karol Bagh..
At least 17 people have been killed after a fire swept through a hotel in India's capital on Tuesday, raising fresh questions about safety standards in poorly regulated budget hotels. 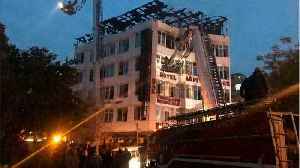 Rough cut (no..
At least nine people have died after a major fire broke out on the top floor of a large hotel in central Delhi.